With each new generation of puppies comes a shift in name popularity. Many names that were previously not accepted for girls have recently become gender independent. Media has played a role in the development of many preferred puppy names over the past few years. We have taken in to consideration the current trends and built an up-to-date list of the top effeminate canine name choices. People are a quality source for feminine names for a dog. 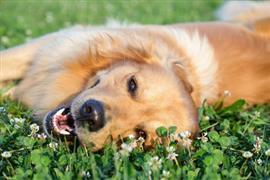 A new puppy is part of the family and popular names often fit in with the household. Avoiding the names of girls in the neighborhood or repeat house guests is a good idea for obvious reasons. Picking an admired fictional character is a common approach that yields excellent results. Get in touch with your cute gal’s personality and see if it matches to any of your favorite icons. Claims have been made that the dog naming trend is moving away from names of people. It is more accurate to say that names in general have branched out in recent years. The list below indicates that naming your pooch after people is still well accepted. If you spend much time seeking a puppy name, you will begin to notice a pattern. The majority of prominent names are very short in length. Glancing through the feminine list will confirm this observation. It is no coincidence that the leading names are short and typically have fewer syllables. There is a reason your aunt goes by Liz instead of Elizabeth Annabelle Montgomery. Bellowing out a name like that could easily leave a new dog owner winded. The advantages to a short name are exponentially greater for your pooch. When you talk to aunt Liz, you will discover that you don’t need to verbalize her name frequently. A dog’s name is a keyword that is crucial in communication. Vocalizing your pup's name is how you gain her attention. When it comes to dog names, fools rush in. Have you ever changed the station on a new song midway through only to find yourself singing along a few days down the road? It can take our minds a little time to accept something new. The first time you look through the female names, your mind is subconsciously searching for familiar ideas. You are naturally pulled towards the options that have taken a place in your memory. In order to branch out and embrace additional possibilities, try not to rush the naming process. Reading through the list once will introduce you to several new names for your girl. Give the names time to sink in before you make your decision. Some of our pages will contain a subcategory. A subcategory is a slightly more specific grouping than the main topic of the page. For a subcategory, we will include a separated table of names and corresponding descriptions. An example of a subcategory of Red Dog Names would be 'Dog Names Inspired by Red Wines'. If you have any subcategory ideas for the Female Dog Names page, we would love to hear them. Use the form below to submit your ideas.